For my second post today, I’ll be tackling the first of a handful of requests for early 4AD material. I may have posted some of the upcoming releases in the past, but consider this an attempt to start phasing out some of the old divshare links in general. I may update old posts, or do fresh ones with full records in due time, so stay tuned. 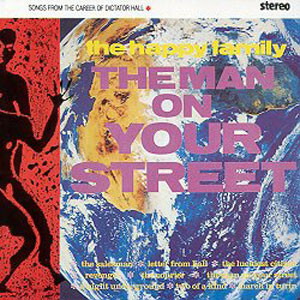 Otherwise, this one’s a fresh post on The Happy Family, a UK based quirky pop/post-punk outfit formed in 1981. The band rose from the ashes of local band Josef K, and released both a three-track single and one full-length record in 1982 on 4AD records, landing the deal after a few support slots with the Cure. These remained their two official releases, though ten demos for an unreleased second album surfaced in 1985 as The Business Of Living. The band’s sound is very different than the material 4AD was releasing at the time… Instead of budding ethereal or doom-ridden post-punk, the Happy Family had more in common with Brel-esque pop, tossing in several literary sensibilities.